Together, brothers Jesse and Sam Evans make up the head brewing partnership at Ale Syndicate. Recent years have given us dozens of new breweries in the Chicago area, however, we've never seen anything quite like this. With their combination of green thinking, a neighborhood brewery set to open this fall and, most importantly, great beer, Jesse and Sam are set to make a splash in the Chicago craft beer scene. Take us back to the beginning, if you don't mind. You both started brewing in California, correct? SAM: Yea, we started out home brewing. We were sharing a house in Oakland. It was a house with a big fenced-in yard and we put in one of those soft-sided portable garages. And that’s where we put our homebrew equipment. So, we had a hose running to it, and a turkey fryer which we were using for our homebrew setup. And that’s where we just started brewing like crazy. That's what started (our first brewery) Lucky Hand. But it was all lagers, and very limited distribution. So, we ended up selling that to a friend of ours when we wanted to move back to Chicago. That was...how many years ago was that? 2009. We’ve been working on this ever since and we’ve been in the market for about 1 month now. Can you tell us a little bit about Ale Syndicate? SAM: Jesse and I are the ones who started it, and we’re brothers – both of us brewers, who kind of trade off when the time comes. We’re going to pour you two different beers. What we’re pouring here, it’s called Sunday Session and it’s our take on a summertime beer. It’s a session beer, which is traditionally a lower alcohol beer; something with a lighter body that is intended for people to be able to drink multiple of and still be standing. So that’s our session beer, it’s 4.8%. So compared to most craft beer it’s on the lower end of ABV. Our second beer that we’ll be pouring here in a moment is Municipal, and that’s our all-Cascade IPA. Instead of using a mixture of several different hops, this is the first of a single-hop series. So, every few months or so we’ll change the hop. So this one is Cascade, which is the first hop that Jesse and I ever brewed with. It’s a piney, resiney, citrusy hop. So there’s kind of a subtle education you can learn, and start to know what the different hops do to the beer and how they contribute to the flavors. So those're our first two, the Municipal IPA and Sunday Session. What has the process been of getting on tap around town? JESSE: That’s a pretty fascinating process. We were really lucky at the beginning because we’re something new and we’ve also spent a lot of time talking to beer buyers and to our distributors. To back up a little bit, we have a distributor called River North Sales & Service, and so they bring all of the Budweiser, Goose Island, Brooklyn beer, Belgian beers – Duvel and things like that – here to the city. And the way it works is, because of the laws, the distributor has to be our only customer and then they sell the beer out. So we’ve gone out and talked to a lot of beer buyers, but the actual selling process happens through the distributor. Other than that, we’ve been bottling up these individual bottles fresh off the keg. Then we walk into a beer bar or whatever and we’ll pour three or four of 'em and just talk to them. Interacting with the beer buyers has been really fun. Do you have your short list of ideal places you would like to be on tap? JESSE: Yea, so it’s all the places we like to drink. SAM: I live on the South Side and there’s a bar called Maria’s and I live just a block from there, so they picked up our beer. The places where we’re for sale right now are the places where we all like to go and drink...we tend to drink at a lot of places. as that the first place in Chicago to serve Ale Syndicate? SAM: I think the first official pour was Village Tap in Roscoe Village. JESSE: Yea, and Beer Bistro then Owen & Engine. Those three were the first to pour I think. We were really excited to be at any of those. About a year ago, you were the New Chicago Beer Company, with intentions to set-up shop on the South Side. At the time, there was a slew of smaller breweries setting up shop in town – what ultimately led to your change in strategy? SAM: So, we ended up changing our name right before we launched our beer. It was the perfect time. It was before we had any beer in the marketplace and that was our opportunity to change our name. So we ended up changing the name to Ale Syndicate. A syndicate is basically a group of people that comes together around something that they believe in, and for us, that’s craft beer. Everybody that’s part of the brewery is an avid beer lover, a home brewer themselves, or has experience in production breweries. So we all bring something different to the table. That’s kind of where that idea comes from. Right now we're in the Green Exchange, which is a collection of sustainable businesses. Next door is part of the same Green Exchange campus where our brewery will be. There’s a lot of interesting stuff in this building. When this building was first built, it was the Vasser Swiss Underwear factory. It’s been a couple things in it’s past life. It’s been the Cooper Lamp factory; that’s what most people in Chicago know this building as. The developer bought this building with the intention of bringing all these sustainable buildings under one roof. There’s Coyote Logistics upstairs, there’re green architects, green construction workers...there's a tea company called Rishi Tea. So there are maybe 18 different businesses in this building. So they also bought the building right next door to us which is an old train station. This neighborhood used to be the city of Maplewood. When the city of Chicago annexed it, it just became part of Chicago. And this train station served them. This building has been a couple of different things in its past life. It’s been an ice manufacturing company, it’s been a stone cutting company, it’s been a lot of different stuff and now we’re building it out to be the brewery. And we’re doing it in two halves. The first half is going to be a 5-barrel brew house with 10-barrel fermenters. We’re doing a lot of different fermenters, that way we’re able to brew a different beer all the time. So we’ll be really flexible and we’ll be able to brew a lot of different kinds of beer. In the future, we’ll be putting in a 30-barrel system in the other side of the building. Until that point, we’ll be using that for a big barrel-aging program. Are you aiming to have everything ready to go by late summer? JESSE: Late summer or fall, yea. We're still in the demolition phase. Then we’ll be starting the construction, and we’re expecting about 80 days for that. nd will you cap off production until you finish the second phase? SAM: Yes, this (first part) is never meant to brew a ton of beer. This is meant to brew different, interesting, really unique one-off beers that we like to brew. The other side will allow us to brew a whole lot of the things that 'graduate' from the original side of the brewery. Has it been pretty competitive to get involved with a specific distributor? SAM: Yea, I think that brings up another good point. There is sort of a mystique about being a homebrewer; that is trying to picture how you ever even get your beer into bars. And something that is kind of cool about the bigger project of what we’re doing is that we’re also trying to be an incubator for brewers who are serious about going professional, but don’t quite have all the tools yet. So, we’re gonna have a lot of stuff to help them, such as classes – one of them being about distribution. A ‘Distribution 101’ if you will, so that we can say to them ‘hey, there is no playbook, but here’s what you can expect, depending on what size brewery you are aiming to have.’ It’ll help to inform them of the kinds of obstacles they might have and the kinds of options available to them. We really believe in having those tools out there for them and allowing to be learn more, earlier on. s camaraderie a sentiment you've noticed exists among other craft brewers, or is it competitive? SAM: Within craft brewers, there is a lot of camaraderie actually. Especially in regional areas, like in Chicago. Everyone is so helpful, everyone is very like ‘stand on my shoulders, let’s get taller, as a whole. Let’s collaborate.’ Our competition as an industry is getting more craft beer drinkers. It’s very rare to have someone who’ll be like ‘I’m only going to drink Ale Syndicate beer.’ They’ll probably come back at some point, but it’s very common to have people just interested in different craft beers in general. JESSE: But we’re completely fine with having people only drink Ale Syndicate [laughs]. By all means, be our guest. SAM: But yea – if you drink a Lagunitas, you’re probably gonna try us, you’re gonna try Metropolitan., you’re gonna try Half Acre There’s going to be a lot of opportunity to try lots of new stuff. So we view our competition just as trying to get more people to start drinking craft beer. And I think everyone else in the industry for the most part has that attitude. And so we’re really into this idea, because it means more opportunity for more great beer. One example of this is, actually, that some of our friends are also starting a brewery called Arcade Brewery. Right now it’s two guys, and they have a lot of other people helping them with the process, but it’s Chris Tourre & Lance Curran. They’re starting out, but they’re not building an actual physical brewery. What they’re doing is, they’re going to be coming in to our space; it’s called a an alternating proprietorship. They’ll be coming in in the evenings when we shut off the lights and head home. They’ll own their own fermenters here, 2 fermenters that will be Arcade fermenters, and there’ll be a couple spots for storage. They’re gonna order their own grain, their own hops...they’re gonna brew their own beer themselves – package it, bottle it. They’ll keep their own records, go after their own licensing, but what we’re gonna do is to allow them to brew on our system. So they’re gonna be there for about a year, and I’m sure by that time they’ll be ready to move out and start their own brewery. And that will open up a spot for the next guys that will come in who are interested in stepping up from home-brewery to being able to use our space to brew on a larger scale. A lot of breweries allow people to volunteer. A lot of breweries take chances to try and let young brewers step up, for an opportunity to even be an assistant brewer at some of these places, when they’re ready. But as far as we know, there’s nobody in Chicago that is doing something like this. So it’s really going to allow brewers to step up to the next level. JESSE: There are a lot more brewers now than there were a few years ago in Chicago, but there needs to be a lot more than there even are now. 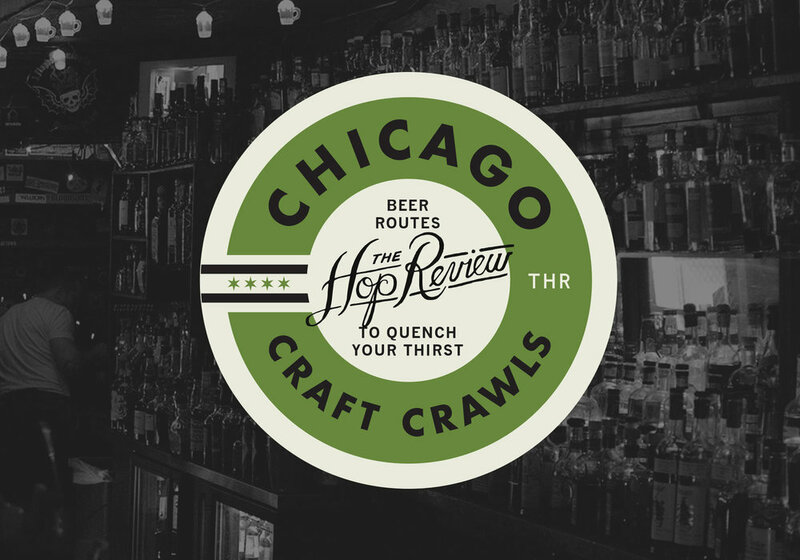 ow do you think Chicago stacks up with some of the other emerging craft beer markets? SAM: So, Chicago yea – we’re the 3rd largest city in the US, but we’re not yet even the 3rd largest craft beer market by any means. We’ve still got a long way to go for that. I mean there are really nice places like Portland and Seattle...so we have a long way to go, but there is this huge boom in craft breweries opening up in Chicago and it’s a really cool and exciting time. JESSE: And really, we’re just beer fans too, you know? We’re not experts on the scene or all that is happening overall by any means. But we’ve made it a point to get our beer into the hands of as many people as possible. And as long as we can focus on taking the time to make these beers as awesome as possible, and the same with the next beer we make, then we can just build from that. o that point, you mentioned you’re ‘fans of beer,’ what do you like drinking when you’re not drinking Ale Syndicate? Do you have time to drink anything else even? SAM: [laughs] We make time, yea. JESSE: Yea, we were drinking a really awesome homebrew from Evanston even today actually. We’ve gone around to different home brewing clubs..we bring our beer and they each bring theirs. It’s like sharing fresh homemade bread. Some people scoff at the term ‘homebrew’ but if you do it right, it often has the potential to be even better than stuff you can find on a larger production line. We actually have a pile of home brews given to us that we need to make our way through. Do you have any tips for home brewers like us who are having trouble producing consistently good beer? SAM: You know what you should do, you guys should really join a home brew club. There are a bunch in Chicago. They meet once a quarter or so and everyone shares recent batches. You’ll even meet people like we just did, home brewers that have been at it for 20, 30, even 50 years. It’s a great resource. JESSE: Well if it makes you feel any better, some of our early batches missed too. I remember one, we did a porter..it tasted a little weird, but we had a sneaking suspicion that it didn’t have alcohol in it. [laughs] Ya know, we’re not sure quite how that happened either. SAM: Yea, when you drink over a gallon of a beer that you’re expecting to be 8% ABV and you feel absolutely nothing...something’s off. e recently tried your imperial porter, Richie, at the Chicago Beer Festival and found it very accessible for people like us who generally lean more towards hoppy styles. Were the styles you’ve chosen to focus on selected because one of you is the hop fan and the other likes more malty beers? SAM: No, we actually really like the same kind of beers. What we used to do actually, back in California, was to go to different beer dinners where we’d get beer flights with our meals, and we would secretly takes notes ourselves. And then at the end, we would rate the aroma, appearance and all other different aspects of each beer and then we would share our notes. And 90% of time our notes would be exactly spot on. There aren’t types of beers we differ on too much, we generally like the same kinds. I dunno if that’s genes or what [laughs]. JESSE: But yea, I think if there’s one way to describe all of our beers, it’s ‘clean,’ that would be one way to put it. Not a lot of syrupy, heavy flavors. And I think a lot of people associate that with the dark beers. They say, ‘Ok, this is gonna be a heavy, viscous beer’ and Richie isn’t that. It’s higher in alcohol, but one of the intentional decisions we made was to downplay what is called the diffusal of oils. It’s the aroma flavor that alcohol has, and sometimes you get that a lot in Russian Imperial Stouts and beers like that, you almost get a vodka in the nose. And that’s something we wanted to minimize with Richie. That also led us to an interesting ‘problem’ – people who normally don’t drink these higher ABV beers, drinking 2, 3 pints of ‘em. We came up with a saying actually, ‘Blame Richie’ [laughs]. SAM: Yea, and Richie is a style developed after months of experimenting. And another we’ll be doing soon is a collaboration with Metropolis Coffee, a great great coffee roaster here in Chicago owned by a friend of ours Tony Dreyfuss. He spends a good portion of his time traveling to coffee regions and sourcing the beans himself. So, he’s going to be going to sustainable coffee regions and farms and picking a bean just for our beer. He’ll then ship it back in it’s green bean form and store it at the roastery until we’re ready to brew. So each day that we’re ready to brew, we’ll call him up and he’ll roast it fresh for us. And a cool part of it is that the beer is gonna change throughout the year. So around the Summer Solstice, we’ll change the bean to get a nice light roast to get a nice light coffee porter. And about the Winter Solstice, we’ll change it to a much darker roast, with a different bean entirely. So you’ll be able to tell this by how the beer tastes and changes from summer to winter, from year to year too. iven our professions, in design and advertising, we have to ask – how do you position branding as an aspect of your business? JESSE: It’s completely necessary. A lot of craft brewers assume that it’s not that important, but it completely is. It’s about communicating the ‘experience’ to the people drinking your beers. And we owe a lot of credit to our design agency, Design Scout, who we were exposed to through working with Metropolis Coffee. We call it a ‘company crush,’ we have a total company crush on Metropolis and their brand, their attention to quality. SAM: So, do you guys wanna go check out the brewery space? It’s under construction, well actually deconstruction at the moment. Thanks to the Ale Syndicate gang for having us in for beers – & we thank them for giving a sneak-peak of their soon-to-be brewery next door to the Green Exchange: originally a train station off of the Metra tracks, stilled hugged by the Metra tracks and the Kennedy Expressway on one side. Most recently a stone-cutting business, the space at 2601 W. Diversey (at Rockwell) has been empty for a few years, but will breathe new life as the proper and official Ale Syndicate brew space come end of Summer 2013. Be sure to drop in for a tour, a pint, and a seat in their beer garden – and of course to pick the brains of these fine folks...they’ll be happy to share. Check for updates from our new friends, Ale Syndicate, over at their website. Cheers!